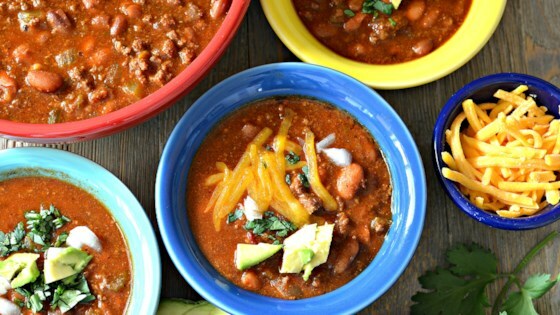 "These chili beans are delicious and so easy to make. Dinner is ready in 45 minutes or less! If your chili doesn't have beans it's not outlaw chili. Garnish with lime, cilantro, diced onions, Cheddar cheese, and diced avocado." Turn on a multi-cooker (such as Instant Pot(R)) and the select Saute function. Coat the bottom of the pot with oil. Cook beef until browned, about 5 minutes. Add onion, celery, and garlic. Cook, stirring occasionally, until onion is translucent, about 5 minutes. Turn off heat. Add chili beans, pinto beans, tomato sauce, green chiles, chili powder, cider vinegar, chile-garlic sauce, oregano, and cumin. Stir well. If using a 6-quart Instant Pot® place pinto beans in last, only filling the inner pot 2/3 full. If you have an 8-quart Instant Pot®, all ingredients will fit without overflowing. I cut the recipe in half, and my husband and I liked it. This was the maiden voyage with the Instant Pot, so appreciated how well it went from start to finish. It's the best chili I've ever made! The Instant Pot made it super fast and easy. Will definitely make it again. Brought it to a tailgate party and even the kids ate two bowls! Was easy to make and my husband liked it ! !